Narendra P. Singh, known to friends and colleagues simply as NP, died last December at the age of 69. When his family wrote to me with the news, Singh’s wife asked me not to publish a tribute or an obituary at that time. I honored her request, but now, after a decent interval, I break my silence, in part to make good on a promise and to settle some unfinished business. Singh was a proud and honest man; he was also gentle and unassuming. “He cannot tell a lie, even a white lie,” Henry Lai, his long-time collaborator at the University of Washington in Seattle, told me years ago. Perhaps most of all, Singh was a meticulous experimentalist who believed in the power of science. 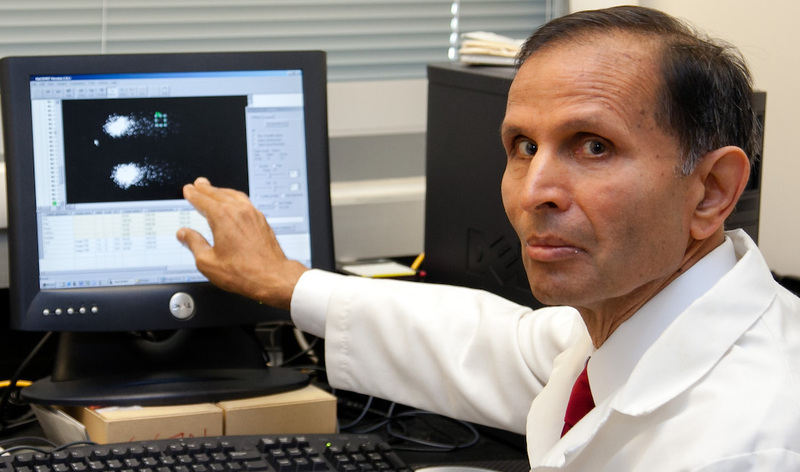 Singh was born and educated in India, then moved to America in 1980 to take a job at the National Center for Toxicological Research in Arkansas. He is best known for his work on the development of the comet assay, a now-standard technique to detect DNA damage. The assay gets its name from the comet-like tail formed by fragments of broken DNA. The greater the DNA damage, the longer and more diffuse the tail. Singh’s assay is used around the world to assess the genetic toxicity of all sorts of chemicals and radiation. Singh published his landmark paper on the comet assay in 1988 based on his studies of the DNA damage caused by X-rays. That single paper has been cited close to 10,000 times —an astonishingly large number. For perspective, that’s about twice as often as the 1953 paper on the structure of DNA by James Watson and Francis Crick. A few years later, Singh turned his attention to the non-ionizing side of the radiation spectrum. He moved to the University of Washington in 1994 where Henry Lai was running experiments exposing animals to microwaves. They would continue to work together for the next 22 years. (Lai retired five years ago.) Like so many others, Singh paid dearly for the decision to do microwave research. It would change his professional and personal life. Singh felt as if he had fallen through the looking glass and entered a twilight zone where science was in the service of money and politics. But it was the real world, one that Singh did not and could not understand. It literally made him sick. I got to know Singh in the mid-1990’s after he and Henry Lai surprised just about everyone with the news that microwaves could cause DNA breaks in the brains of rats. News of their findings leaked out and spread quickly within industry circles. Even before they had published their first paper together, operatives from Motorola and the CTIA, the powerful industry lobby group, came to their lab to see what they could find out. At the time, the nascent cell phone industry was still reeling from a lawsuit, filed a couple of years earlier by David Reynard of St Petersburg, FL. Reynard claimed that his wife had developed a fatal brain tumor after using a cell phone. Lai and Singh’s peer-reviewed paper would likely be Exhibit A in any future litigation unless the industry could show that their work was faulty and unrepeatable. In the wake of Reynard’s allegations, CTIA, led by Tom Wheeler, pledged research to rebut all health claims. Wheeler brought in George Carlo, a Washington-based fixer, to help him put out the fire. The strategy was simple: Do as little as possible to resolve the science. After all there was always the risk that research might prove Reynard right. Lai-Singh’s DNA results threatened to expose the hollowness of CTIA's and Carlo’s plan. Executives at Motorola, at the time the leading wireless company, were worried that Carlo’s confidence game would backfire. Q. Balzano, the company’s point man on the growing RF problem, wanted actual research. He embarked on a multi-million-dollar research program, which included a project to test Lai-Singh’s results. That job went to Joe Roti Roti of Washington University in St. Louis. Balzano had moved quickly: The $400,000 contract was signed in December 1994, six months before the Lai-Singh paper appeared in print. Roti Roti was the head of cancer biology at the university’s Radiation Oncology Center. He had made a name in the field of hyperthermia —using heat as an adjunct to chemotherapy— and in the process had carried out a number of studies on DNA damage. Roti Roti had an impressive list of publications, notably in the community’s flagship journal, Radiation Research. On the other hand, he had no prior experience with the genetic effects of microwaves and was new to the comet assay. Roti Roti was under orders to only attempt the Singh assay if he first found that the Olive assay showed no microwave-induced DNA damage. Motorola lawyers were buying some insurance. Even if the Olive assay showed DNA damage, they would preserve —to use an expression from the Nixon era— deniability. That is, they could still maintain that the Lai-Singh experiment had not been replicated. Left unsaid was the general consensus within the research community that the Olive assay was not as sensitive as Singh’s and therefore less likely to pick up a weak effect. The first results of the Motorola project were presented 18 months later in Victoria, British Columbia, at the 1996 annual meeting of the Bioelectromagnetics Society. Lai and Singh were both in the audience. I was there too. Over lunch before Roti Roti’s talk, Singh was on edge. He had read the one-paragraph summary of the experiment that was in the conference book of abstracts given to the attendees on registration. Singh suspected that Roti Roti did not know what he was doing. The following March, Roti Roti submitted his results to Radiation Research, where the paper was handled by John Moulder, an associate editor. He sent it out to four reviewers. One of them was Singh. Singh now had all the experimental details and they reaffirmed his worst fears. The strongest evidence that something was amiss was in the positive controls. These are an essential component of any rigorous experimental design. A researcher must be sure that the laboratory system being used can indeed detect the effect under study, in this case, DNA damage. An agent known to break DNA, typically X-rays or gamma rays, is applied as the positive controls. Both Singh and Olive had each used X-rays as they worked to develop and fine-tune their respective assays. Roti Roti reported that he could detect DNA damage from gamma rays at unusually low doses —down to 0.3 cGy (0.3 rad). “This is an incredible accomplishment,” Singh wrote in the peer review he sent to Moulder. He pointed out that the best Olive herself had been able to achieve was a sensitivity down to 200 cGy, that is, a dose that was close to one thousand times higher. Singh’s assay is more sensitive, but he could still only see damage above 3-6 cGy. Roti Roti was claiming that he could do ten times better. Singh was offended. He had spent more than a decade perfecting the assay and he did not take well to being told that a novice could walk in and do so much better than everyone else. Singh had no confidence in Roti Roti’s work. He wrote a detailed critique of the paper that ran two-and-half, single-spaced typescript pages. He wanted Radiation Research to reject it. There were two questions at the bottom of the peer review form: Could Singh’s comments be shared with the other co-reviewers, and, second, should the editor forward their reviews to him. Singh checked both boxes in the affirmative. When he got the other reviews, he felt vindicated. Peggy Olive was another of the reviewers and she, like Singh, could not accept that Roti Roti had achieved such a high order of sensitivity. Olive did not mince words: “Obviously, I’m concerned with the statement that my method can detect damage by 0.3 cGy [radiation],” she wrote, “I would love to have [that kind of] sensitivity.” The norm, she said, was a dose that was 150 times higher than what Roti Roti claims to have achieved. Olive made one additional damning point. She echoed Singh’s reaction after watching Roti Roti present his preliminary results in Victoria. Roti Roti seemed ignorant of some key experimental details: She had talked to him at a meeting a year earlier about problems that turned up while running such experiments. He “did not seem to understand my concern,” Olive wrote. Nevertheless, Olive took a softer line than Singh on publishing the Roti Roti paper. It could be salvaged, she wrote, but it would require more lab work and “substantial revision.” If he did so and resubmitted the manuscript, she asked to see it again before publication. There were two other reviewers. One was Brenda Cobb, a researcher at the Brooks Air Force base in San Antonio, who recommended accepting the paper after substantial revisions and further review. Her concerns were more about Roti Roti's grammar than his science. Neither Singh nor Lai understood why Moulder had picked her since this was not her field of expertise. The reason was probably because the U.S. Air Force was the largest funder of microwave research in the country and had a major stake in how the controversy played out. (Think radar, rather than cell phones.) Moulder may have felt it was a good idea to keep the military in the loop and, in the process, give the Air Force an advanced look at the Roti Roti paper. Lai, among others, speculated that the reviewer was Mays Swicord, who was in charge of Motorola’s radiation biology research program. There is no hard evidence to support this, other than if it were in fact Swicord, neither he nor Moulder would want to admit it. Seeking a peer review from anyone at Motorola, which had paid for the research and which had an obvious stake in the outcome, would have qualified as scientific misconduct. In June, just two months after Moulder sent out the paper for peer review, Singh sent me a one-sentence email. “Looks like John Moulder is going to let Roti Roti publish his RFR/comet assay paper in Radiation Research,” he wrote. He did not say how he had found out. Singh made two last ditch efforts to stop the paper. In what he called a “personal” and “unofficial” letter to Moulder, he repeated his warning that, “it is not possible to resolve the difference between control cells and cell irradiated with 0.6 rad [0.6 cGy].” Then he raised the possibility that some more nefarious forces might be at work: “I hope this not the case of scientific fraud and is only a serious mistake,” Singh wrote. Singh also sent an e-mail to Motorola’s vice president for research [probably Q. Balzano], making the same general arguments. There is no indication that either Moulder or anyone at Motorola ever replied. In early August, the managing editor of Radiation Research, Martha Edington, sent a letter to Singh that confirmed his prediction. “Although you recommended that the manuscript be rejected,” she wrote, the associate editor [John Moulder] and the other reviewers “felt” differently. Roti Roti had made revisions, she noted, and the paper had been accepted. From then on, the Motorola crew took the position that they had tried and failed to repeat the Lai-Singh work. Roti Roti was right and Lai and Singh were wrong. End of discussion. Within the year, a six-member group led by Moulder and Robert Malyapa, the first author of most of Roti Roti’s DNA papers, completed a review of the possible link between cell phones and cancer. The evidence was “weak to nonexistent,” they concluded. In the discussion of the DNA work, they reiterated the claim that the sensitivity of the Olive assay was “comparable” to Singh’s. The effects that had been observed by Lai and Singh, they argued, were due to confounding, of one type or another. The review paper was published in Radiation Research. No one has to this day. What To Do with the Peer Reviews? At first, I did not challenge their request to keep the peer reviews confidential. But their outlook changed a few months later when the paper came out with no sign of any changes. Still, peer review was hallowed ground within the scientific community (less so today than back then). I was concerned that their many enemies would blame Singh for the leak and that the backlash would be severe. Lai and Singh had been the focus of relentless attacks over their DNA work. Even before their first paper appeared in print, Motorola’s PR team plotted how to lessen its impact —this was spelled out in the now well-known “war gaming” memo (MWN, J/F97). Soon afterward a group funded by the U.S. Air Force included a lengthy attack on Lai and Singh’s DNA study in a paper published in Radiation Research. In response, Lai wrote to one of the authors, Melvin Frei, whom he considered a friend. “Am I such a ‘junk’ scientist who would report unreliable data and did not carefully carry out experiments?” Lai asked Frei, “What have I done to provoke such an attack from you?” Even so, Lai closed his letter with “I will always be your friend.” Frei never replied. Lai and Singh were also jerked around by George Carlo and those running his CTIA research program. In the end, their frustrations with Carlo grew so great that they wrote a history of what they called “a very strange experience” and less politely “a disgrace to the American research establishment.” Carlo threatened to sue them for libel, but soon dropped the case. When the Roti Roti paper finally appeared in print, I called Olive to see what she had to say for an article I was preparing for Microwave News. At first she declined to be interviewed. “Joe is a friend of mine,” she told me, explaining that she would rather not get involved with what she called the “politics” of the issue. Two weeks later, just as we were preparing to go to press, she called back, most likely at Roti Roti’s suggestion. I had told him —without letting on that we had the peer reviews— that I was aware that Olive had some reservations about his work. In the interview, Olive’s criticisms were much gentler than what she had written to Moulder in the peer review. She did concede that she had never been able to get the sensitivity “down that far.” Never below 1 cGy, she told me, and more realistically not below 5 cGy. Now, close to 20 years later, I am finally setting the record straight. To this day, Lai keeps a current count of papers on studies of microwave-induced DNA breaks using the comet assay. As of this April, he has identified 76 papers, of which 49 (64%) showed DNA breaks and 27 (36%) did not. Eliminating the seven DNA breaks papers from Roti Roti’s lab, the papers showing effects rises to 75% of the total. Lai’s count does not include the report from the National Toxicology Program (NTP) which shows that, in its $25 million experiment, rats exposed to cell phone radiation developed elevated rates of cancer and DNA breaks in their brain. Those results, which have been presented at scientific meetings, have yet to be published. * Members of Roti Roti’s group published two papers in December 1997, one covering 2450 MHz and one covering two cellular phone frequencies (835 MHz and 847 MHz). There were suggestions that they be combined. In April 1998, they published another paper on gamma rays.